Dr. Goodvibe are music alchemists, fashioning an original voice in contemporary music from a broad palette of influences, derived from a multiplicity of musical styles. The music is an upbeat blend of sonic colours tailored from their interest in funk, blues, Latin, jazz, country and even classical styles. • Edu is a unique and diverse singer songwriter whose philosophical and often satirical commentary on life openly elucidates his heart. The eternal optimist, EDU's music is raw and honest and uplifting, with comparisons as diverse as David Gray, Jack Johnson, Donavon Frankenreiter, Lior, Van Morrison, and JJ Cale – just to name a few. Nominated for Best Male vocalist in 2004, ABC Newcastle Music Awards. 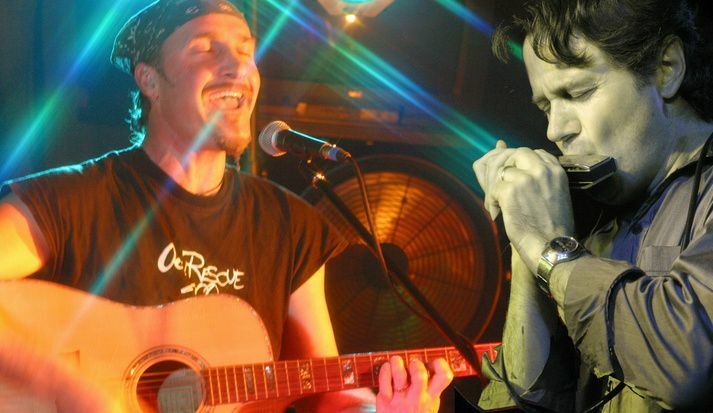 • Christian applies a fresh approach to harmonica, in any idiom he plays. As a result, he has countless sessions to his credit. He has played for many years with artists and bands across wide cross-section of music styles. Seeing him perform opens many minds to the versatility of the harmonica. In Roger Miller’s hit stage musical "Big River” he featured as a soloist in the orchestra, and in character roles on stage. In July 2010 Christian was part of a nine piece band, performing a musical written by Adam Guettel called Floyd Collins. Performed at the City Recital Hall, the show is recognised as “one of the most powerful, original, quirky and musically demanding musicals ever written”. In April 2007 Christian performed Sven Libaek's Harmonica Concerto with Orchestra Nova, and again in October 2008 with the University of Newcastle Symphony Orchestra. In December 2008 the Concerto was performed again under the baton of Sven Libeak himself, with the Sutherland Shire Symphony Orchestra. A performance with the Central Coast Symphony was recorded in June 2010. The concerto takes the form of a suite in three movements, which was inspired by the Australian Outback. In 2003, Christian won the award for best "Instrumental" at the 1233 ABC Newcastle Music Awards for his tune entitled "Five Islands". He was also a nomination for the award in the jazz category in 2003, 2004 and 2005. Aside from Dr Goodvibe and his own CD's, Christian has recorded two albums with Paul Robert Burton, and an album of original material with Guy Dickerson, entitled "Planet Bound".He has also appeared as a guest artist on more than forty other albums, and played with many of the top artists in the music industry. He has won "Gold Harmonica Awards" at the Hohner National Harmonica Championships in Tamworth; and worked as Larry Adler's harmonica technician during the Australian leg of Adler's international, "Glory of Gershwin Tour". ?He has a sweet and recognisable sound distilled from wide experience.